SAMTEC 'S expanded Data Rate high-speed cable assembly systems meet stringent signal integrity specifications on a variety of centrelines and configurations. The systems use high-speed connectors, miniature ribbonised co-ax and twin-ax cables, and transitional PCBs. The cable assemblies are available on 0.8mm and 0.5mm pitch (EQCD and HQCD series), in differential pair routings (EQDP and HQDP series), in differential edgecard designs (EEDP series) and as J-TAG interfaces (HHSC series). 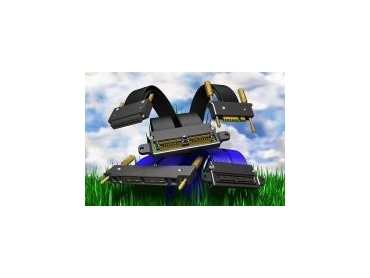 The cable assemblies come in standard vertical or edge mount terminations. A variety of standard locking and latching options are available. The cable assemblies use cable with a low dielectric constant (k=2.1), either in 38 AWG miniature co-ax cable for 50Ω applications, or 30 AWG twin-ax cable for 100Ω differential applications. These assemblies are available in cable lengths up to 1m. Flex life for the 38 AWG co-ax exceeds 25,000 cycles. The bend radii is 2.5mm or less, they offer skew of less than 5ps a foot differential within a pair, less than 20ps a foot single-ended. They also have EMI performance rated to FCC Class A. Solder joints can be fully encapsulated for added reliability. At 4m length in single-ended configurations the cable assemblies are rated at 2.8Gb/s (EQCD Series) and 2.32Gb/s (HQCD). These ratings reflect the point where an insertion loss of -3dB occurs with the cable assembly. These ratings do not represent the potential maximum performance of the cable assemblies.